The Govt. 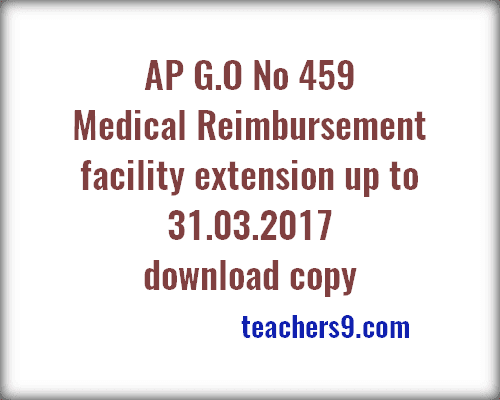 of Andhra Pradesh has released Medical Reimbursement facility extension G.O Rt No 459 on 22.11.2016. As per this G.O Rt No 459, Employees Health scheme and Medical Reimbursement system under APIMA Rules 1972 has extended up to 31.03.2017. Representation from the President,Andhra Pradesh Secretariat Association, dt:22.09.2016. Representation from the Chairman, APNGO’s., Association,Andhra Pradesh, dt:23.09.2016. In the letter 3rd & 4th read above the President, Andhra Pradesh Secretariat Association and the Chairman, AP NGO’s Association, Andhra Pradesh have requested the Government to extend the above provision up to 31.03.2017 along with Employees Health Scheme in parallel. Government after careful examination, hereby extend the reimbursement facility as indicated para 3 of (v) in the G.O. 1st read above with effect from 01.10.2016 to 31.03.2017. This order issues with the concurrence of Finance (FMU.HM&FW) vide their U.O.No.42028/33/2016-FMU-HM&FW, Dated.16.11.2016. So finally those who are eagerly waiting for Medical Reimbursement facility extension G.O, They can download the copy of G.O No 459 and utilize Medical Reimbursement facility.